After qualifying for a Dota 2 major, international esports team Fnatic suddenly dumped their offlane player Khoo “Ohaiyo” Chong Xin for Saahil “Universe” Arora, reportedly during a pizza dinner. 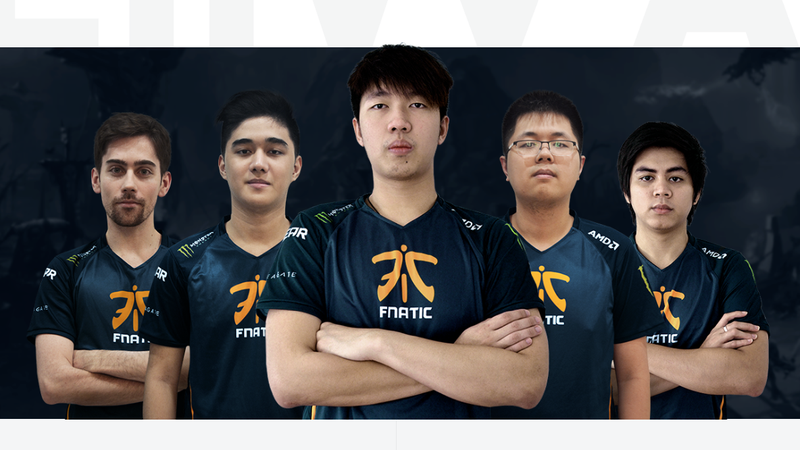 The official announcement came January 13, when Fnatic confirmed that the former Evil Geniuses offlane player Arora would be joining the team, taking Ohaiyo’s role in the offlane. Arora has won one International and competed in all but one since the first in 2011, so he has some pedigree and talent to offer. Ohaiyo is also considered a talented player in his own right, however, and it’s hard not to see his influence in the team’s wins during the Katowice qualifiers. It is so sad and cruel, after winning TNC and qualified to ESL One Katowice Major Main Event. We had a pizza dinner to celebrate but after we finished, I was informed by Adam Shah ( Fnatic coach ) and Eric Khor ( Fnatic Manager ) that I’ve been replaced by Universe and they told me that Universe arrived Malaysia just the day before Fnatic vs TnC Grand final EslOne Katowice which was last Thursday. 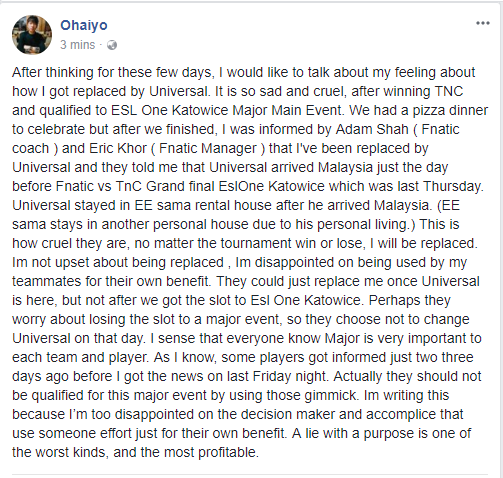 Ohaiyo goes on to say that the whole team knew he was leaving as well, days before the qualifier match and pizza party. In a statement from Fnatic’s chief gaming officer Patrik “cArn” Sättermon, the team says the sudden swap was not just due to Arora’s availability, but due to the sudden roster lock announcement. All the while, blame from the public and even other pros started to fall on Jacky “EternaLEnVy” Mao’s shoulders. A current member of Fnatic, Mao has been known as a decision-maker on teams and provided the housing for Arora during the swap. Mao went on the HotCox Dota 2 podcast to discuss these issues, saying the team had been thinking about replacing Ohaiyo and another player, Xcalibur, since October 2017. He also said the timing was due to how quickly they found out that Arora was available.